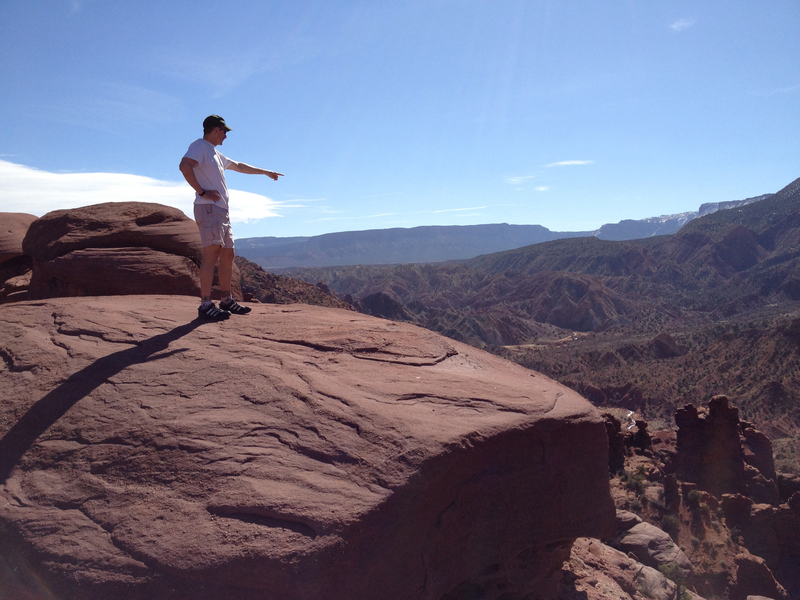 Half way between California and Colorado is Zion. So Brit and I booked a night at the Cable Mountain Lodge near the entrance to the park. We rose before the sun to squeeze in a hike through the Narrows. The first mile was paved. The trail disappeared with the sidewalk. 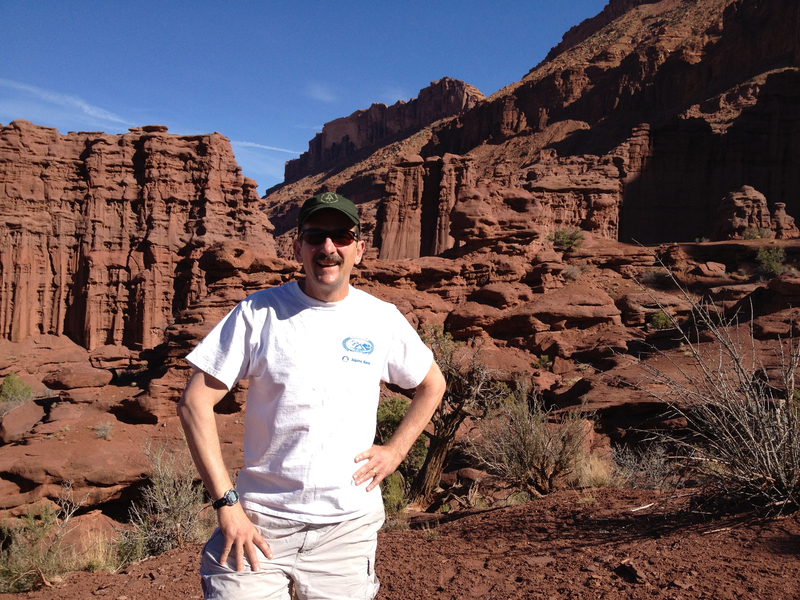 Surely, the trail will pick back up around the next curve in the canyon. Brit wades deeper. The trail guide did say something about expecting to get wet. And to guard against hypothermia. The sun is slow to warm up the canyon. 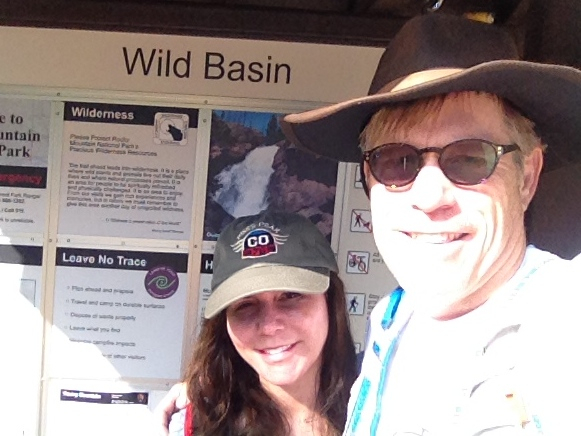 We hiked up the Virgin River for maybe a quarter mile. The cold, deep water didn’t turn us back. 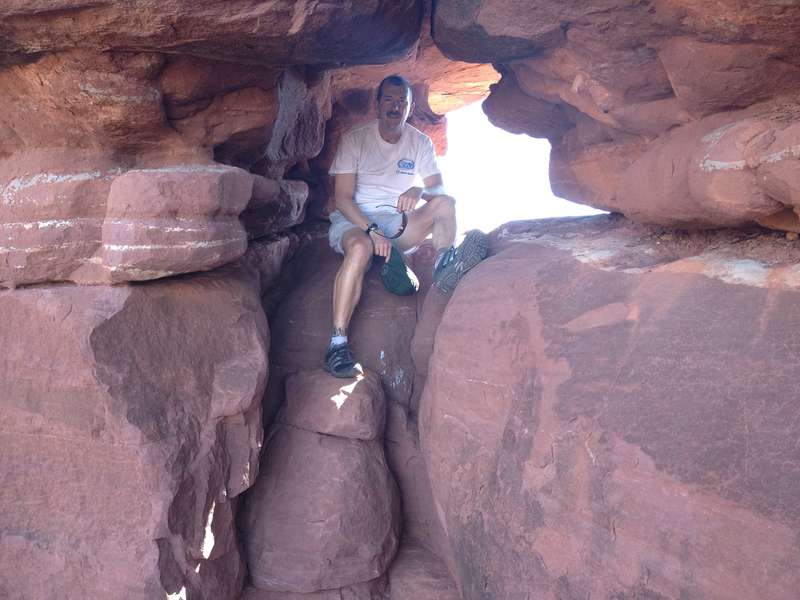 The canyon walls drew us in like sirens to the rocks. But we had to get home to Colorado by nightfall. We’ll return for sure to Zion when we’re not just passing through. We skipped the high speed Interstate for Hwy 9 through the park, connecting later with highways 89 and 12, traversing Escalade, Boulder, the Dixie National Forest and Capitol Reef National Park. A virtual lifetime of vistas. 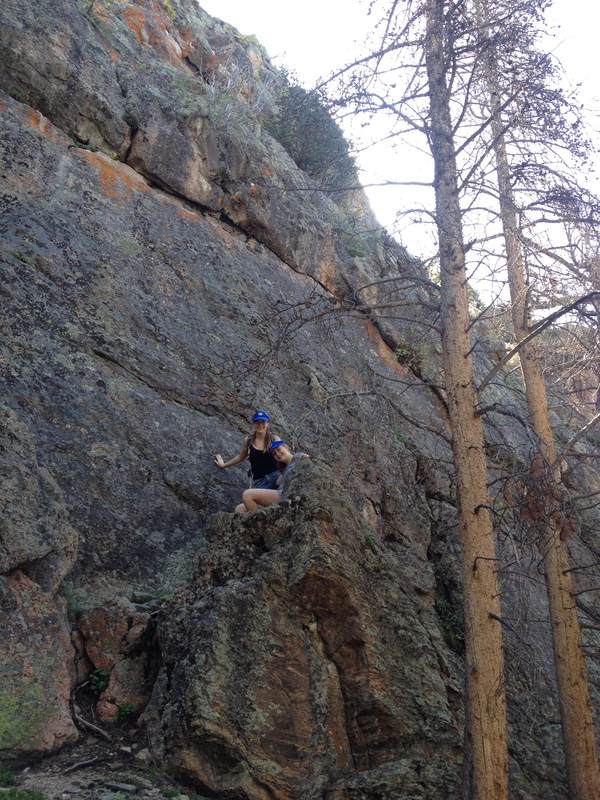 Barely out of Zion, just past the tunnels, we saw a rock that had to be climbed. Brit preferred walking the sandstone barefoot to her sandals. She finally made it to the top, after me. Brit celebrated her climb with a namaste. I just did my best to keep my balance. I don’t have words to describe the splendor of our remaining drive through Utah. We saw flaming orange aspen in the Dixie Forest and petroglyphs in the cliffs of the Capitol Reef rocks. If you get a chance to drive between Colorado and California, do yourself a favor and skip the Interstate. Take the scenic byway. Brit joined us up in Vail last night. That means a new hiking partner. And Brit’s not afraid to take on the big ones. 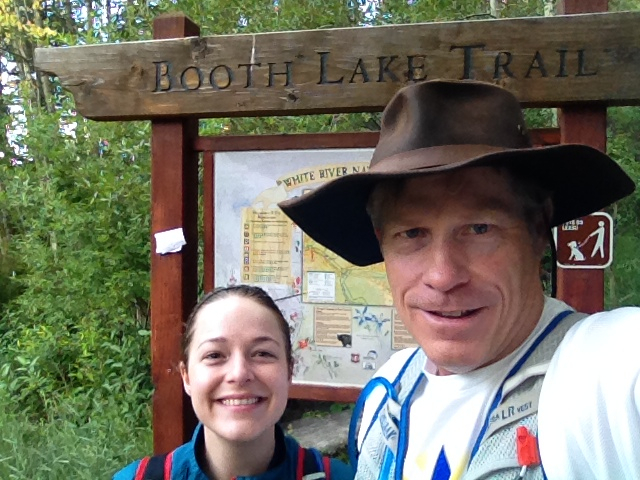 We launch from the trailhead to Booth Lake by 8am. This trail is easily the most recommended by the Concierge based on the conversations I overhear as I walk by. And the trail guide suggests it’s a favorite of tourists. Fit tourists anyway. This puppy rises 3000 feet in four miles. 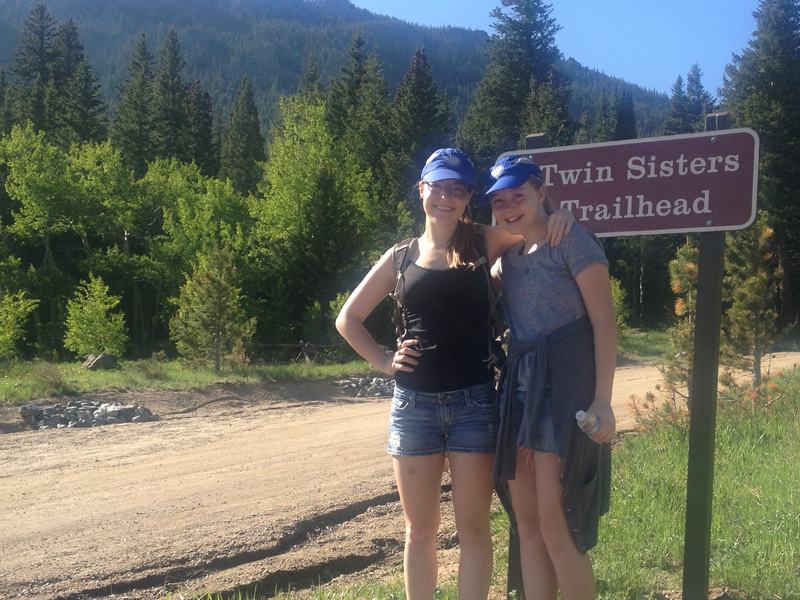 The trail begins its steady 4.5 mile rise through old growth Aspen. There is one other lone hiker who parks alongside us at the trailhead. He starts out about five minutes ahead of us. Brit quickly finds a rock. We both agree it has a certain “Pride Rock” quality. We encounter a trio of hikers descending. 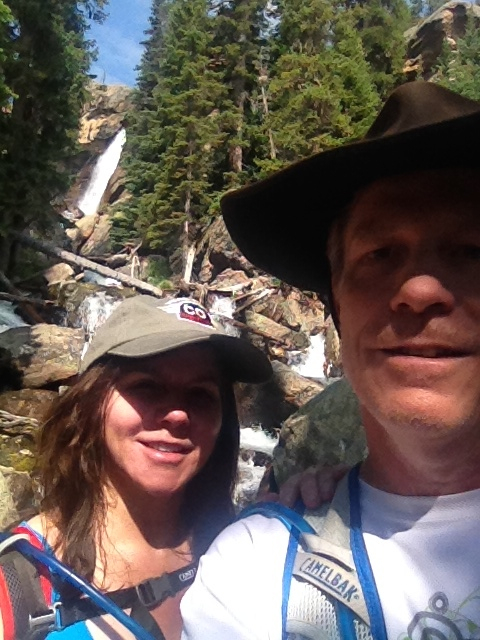 They ask us if we are headed to the lake or just the falls – which are only about two miles up. We respond with the lake and they say it’s well worth it. 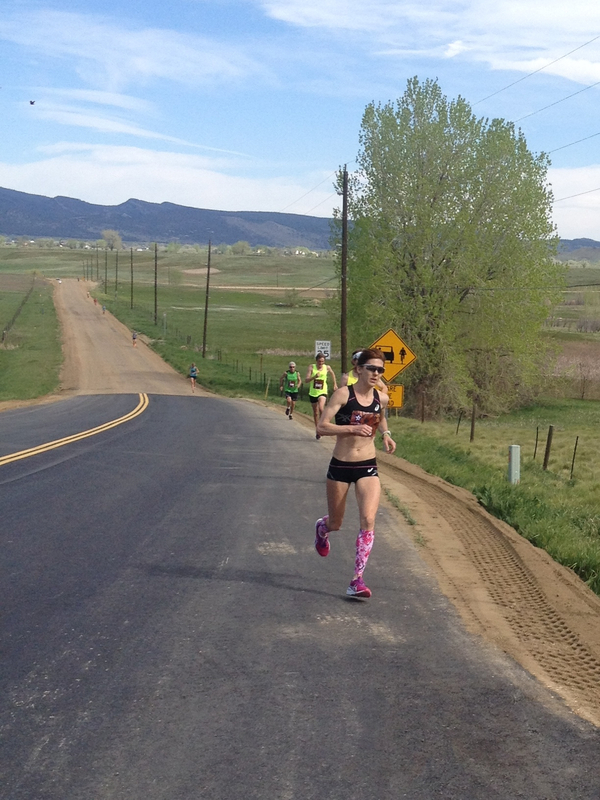 Brittany leads most of the hike and holds a 29 minute pace the first mile. The girl is in shape. My legs have yet to recover from yesterday and I find myself struggling to keep pace. The Aspen yield to thick Spruce after an hour of hiking. 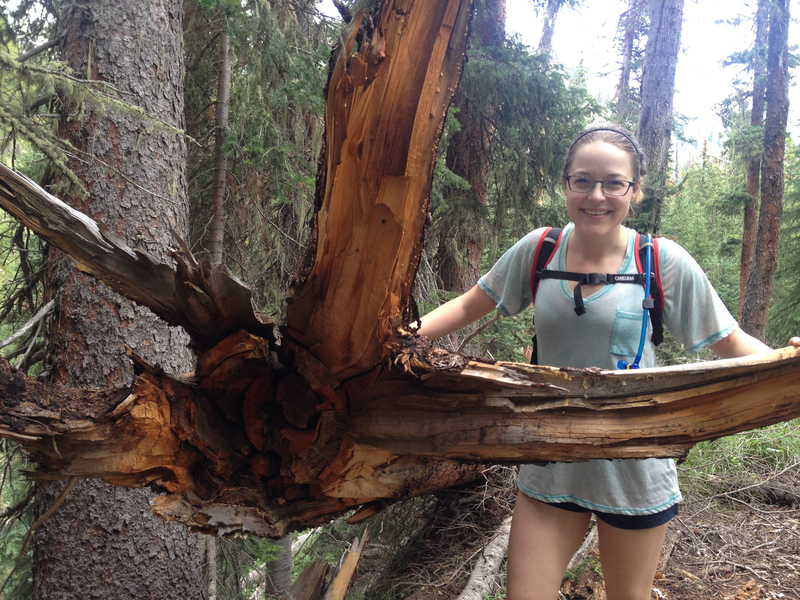 Brit finds this uprooted tree pretty cool. Not sure if the picture captures it (you might need to click to enlarge it) but these split roots look awesome on the trail. The trail is mostly dry but the steepness make it challenging anyway. There is a bit of mud and several fun creek crossings. Brit is happy she borrowed Ellie’s waterproof boots. We arrive at the falls after about two miles, or an hour, of hiking. We suspect most hikers only make it this far. The grade is challenging. This photo captures one of the first set of falls. A later set is much more dramatic but also more difficult to photograph with a live person in the picture. The trail increases its slope after these falls and nice views open up behind us of the Holy Cross Wilderness Area above Vail Mountain. 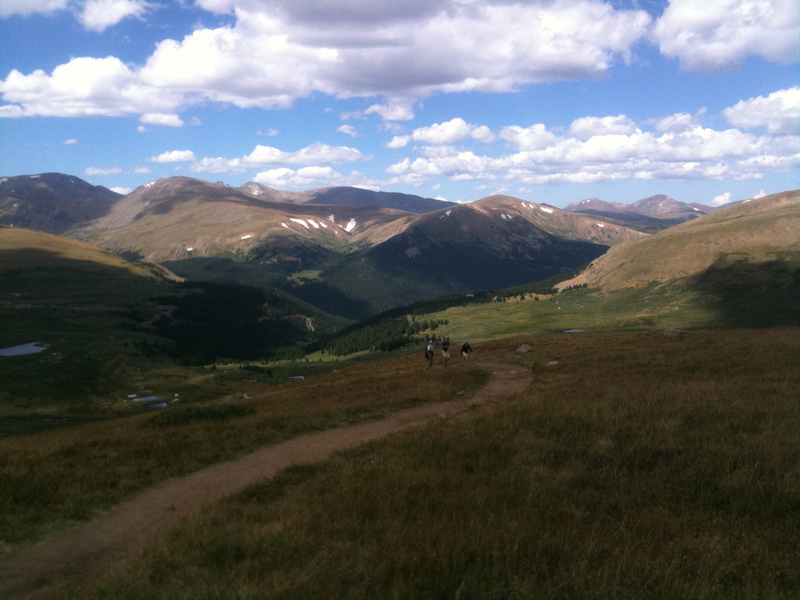 After three miles, we begin to see the moraine in the Gore Range where this trail will ultimately lead us. The slopes still hold snow. The vegetation along the trail is lush. We see many of the same flowers we saw along the Lost Lake Trail, but a million times more thick. The trail alternates between forest trees and meadows. We see a deer bound through one meadow so fast we’re not certain what it is at first. Brit suggested that maybe it was being chased by a mountain lion. We then both agree that we think mountain lions are nocturnal. This is what one usually says to avoid thinking about the potential danger. 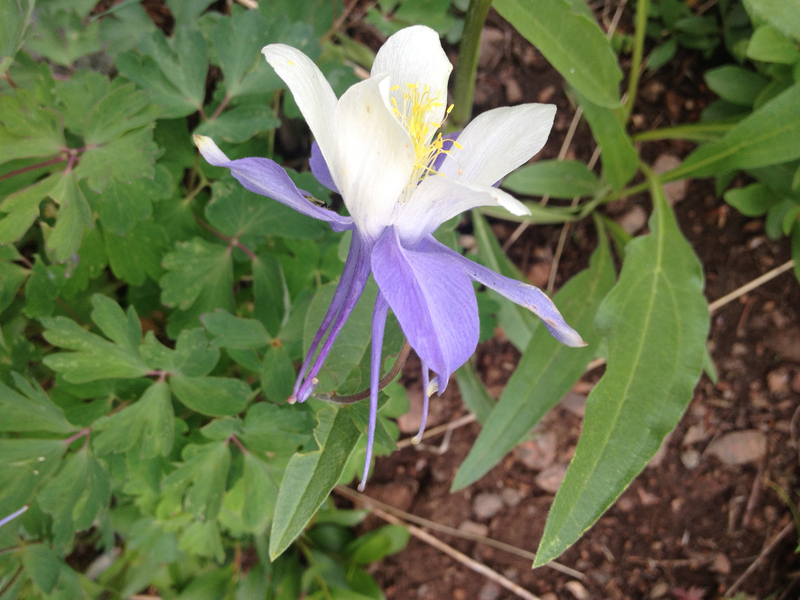 The most amazing of all the wildflowers we see is this Colorado Columbine. Imagine fields of them. 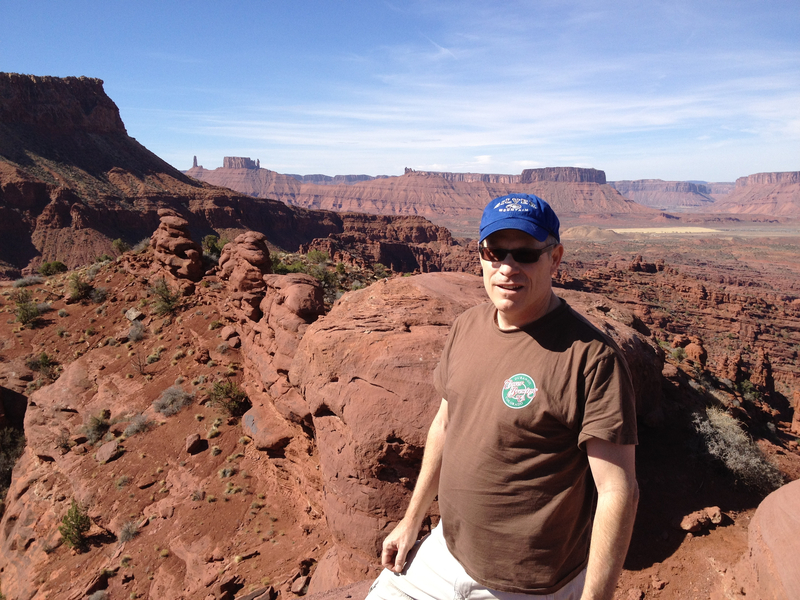 This is a great hike for sightseeing. We see a beaver super up close. He has bark all over his lips. We see a couple of weasels. A second deer near the lake. And then for the first time ever on a hike, we see a mountain goat. So cool. 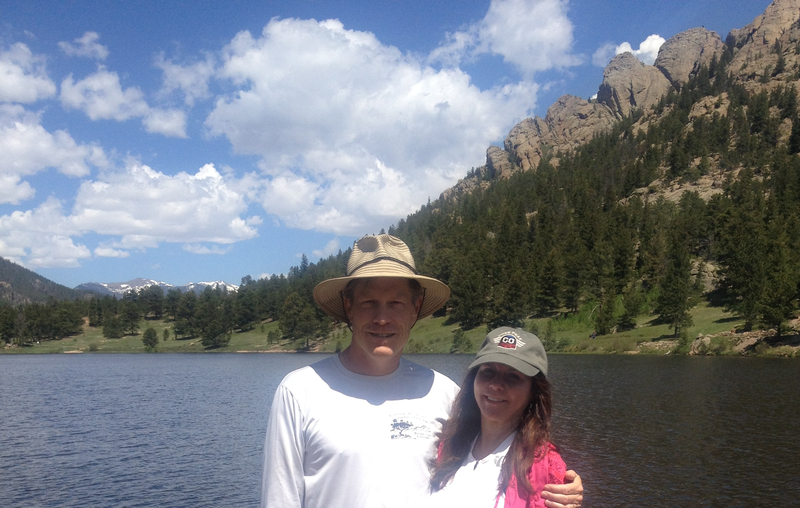 We expect the lake to only be a 4.1 mile hike and become a bit discouraged as we near the moraine and never see it. We keep thinking it will be over the next rise. After 4.5 miles, we see it and are amazed. 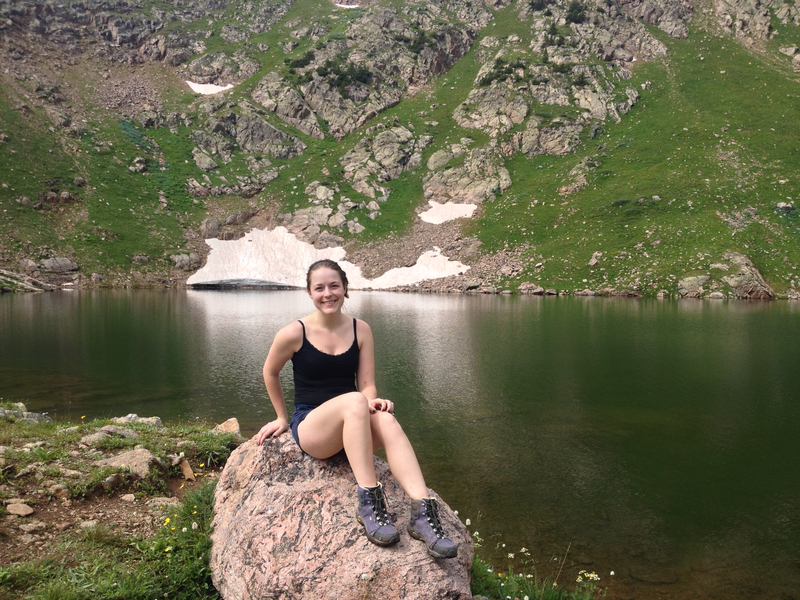 Alpine lakes have a way of taking your breath away. 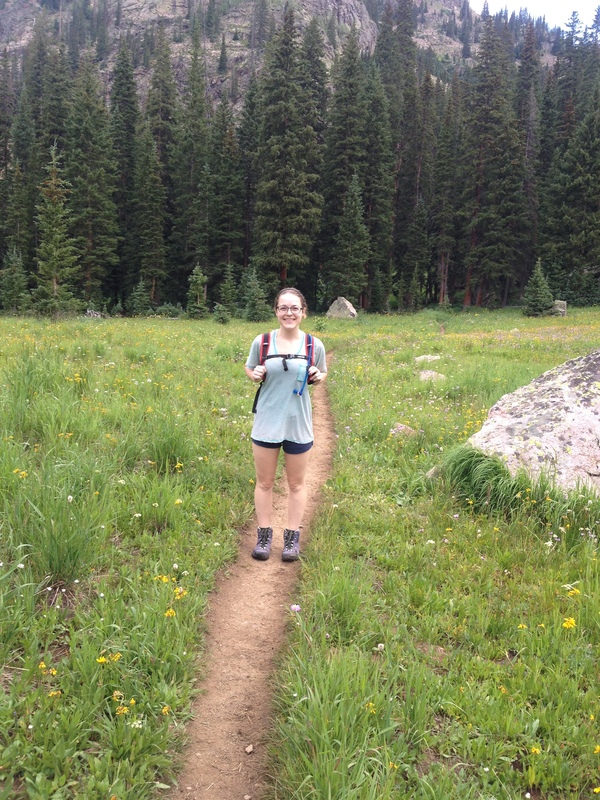 Not just from hiking up to 11,500 feet. This one is so pristine and serene. There is still snow hanging over the shores. And the water is crystal clear. There is no one else up here. We take a good 15 minutes to enjoy it. We leave sooner than we care to because rain clouds are forming. We hike pass tons of others on their way up, mostly below the falls. Some are headed to the lake and we encourage them. We understand why most don’t make it past the falls. That’s a great hike too, for sure. Reaching the lake is likely too much for the average tourist. We both feel special for being able to see it today. I wore out my family yesterday. 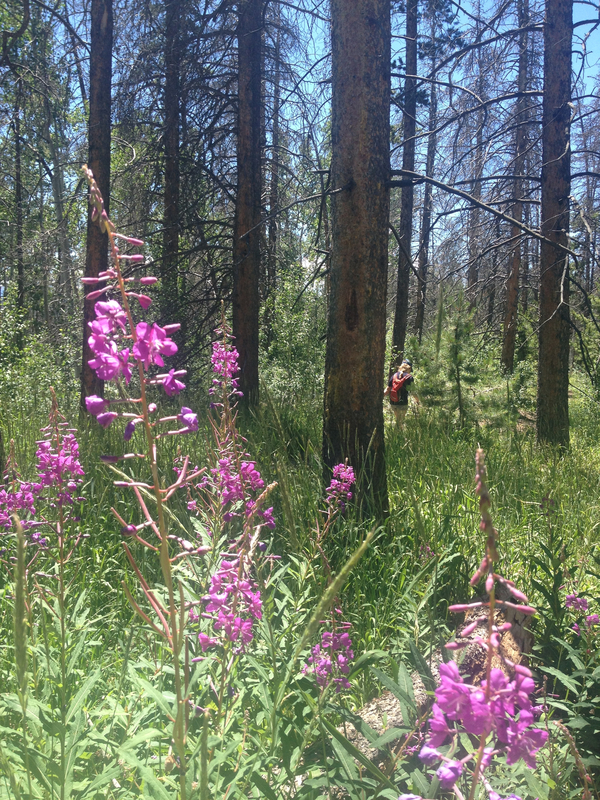 The consensus for today’s hike is a ride up to Eagle’s Nest on the Eagle Bahn Gondola to hike the Fireweed Trail. Sounds like a going-out-of-business sale at a dispensary. I count a win for getting them out of their 500 count thread sheets and over-stuffed pillows before noon. Perfect weather on top of Vail Mountain. Full sun with a cool breeze. 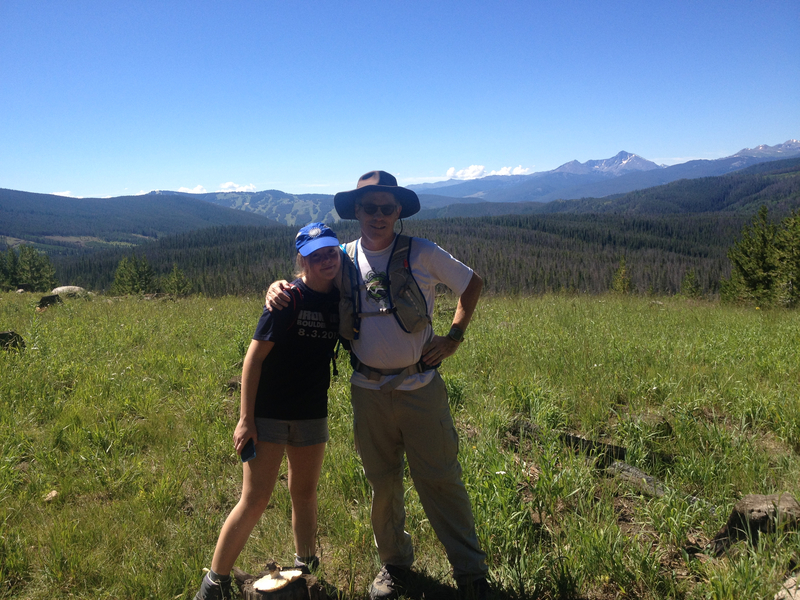 Only a two mile loop, the Fireweed Trail might not be long enough to enjoy such a perfect day. Fireweed Trail is actually quite nice. The sort of soft dirt and pine needles I love to run on. We see several deer up close too. We are all pleased with the hike but it is indeed too short. We decide to stay in the area for some of the activities. 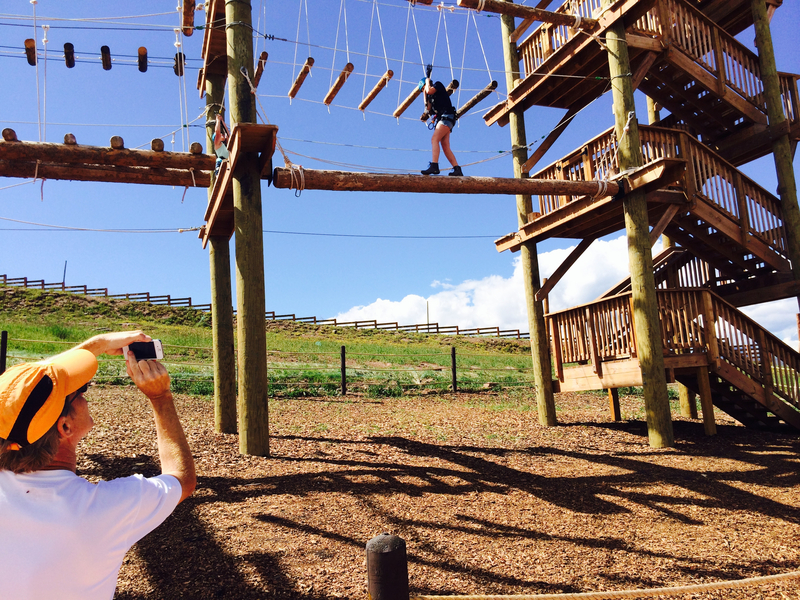 Ellie surprises me by going on the rope course. I thought she would be too afraid. She does well but it is extremely athletic and strenuous. She has just enough strength afterward for a zip line. 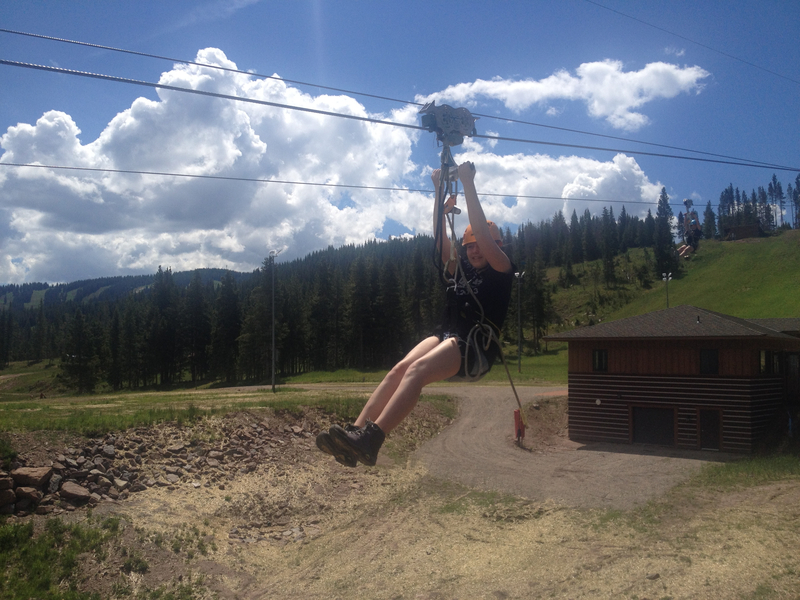 I zip with Ellie – my first ever. The guides are all supportive of me taking pictures, but also seem quite confident that I’ll drop my phone. I don’t. We finish the morning with lunch at the Bistro at Eagle Nest and return on the Gondola to Lions Head. I decide on the drop down the mountain that I will return later to run back up. The trails are chock full of mountain bikers. They’ll have to yield for me. Karen and I lift some weights back at the hotel. Then I return to Lions Head to run up the mountain. Following the ski trail maps is like trying to use a phone book map for city streets. Quite a bit of detail is missing and the drawings are only rough approximations. The trail signage is possibly worse. My uphill pace is slow enough that I actually can read a map. This doesn’t help me much though given the poor quality of the maps and signage. Still, I manage to nearly reach the top of the gondola run before I have to turn around from fatigue. I take some of the steeper biker trails on my descent. In spite of the short hike to start the day, I’m totally spent now. I learn that Brit has arrived once I return to the hotel. She plans to do a massive hike with me tomorrow. We finish tonight with pizza at the Blue Moose. Spent and stuffed. 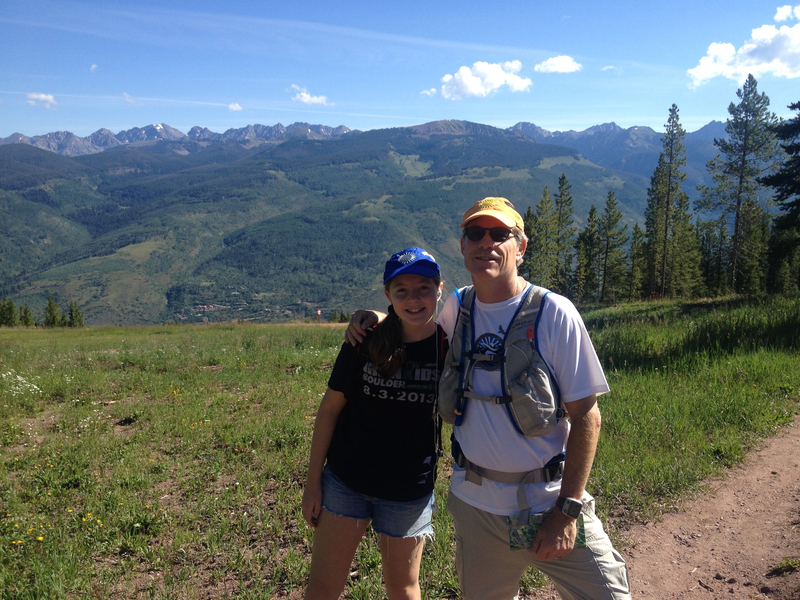 Vail is one of my favorite Colorado mountain towns. Although it’s been a few years, we come here often. Usually for spring break. The last time we visited on our wedding anniversary (August 1st) was in 2007 for our twentieth. 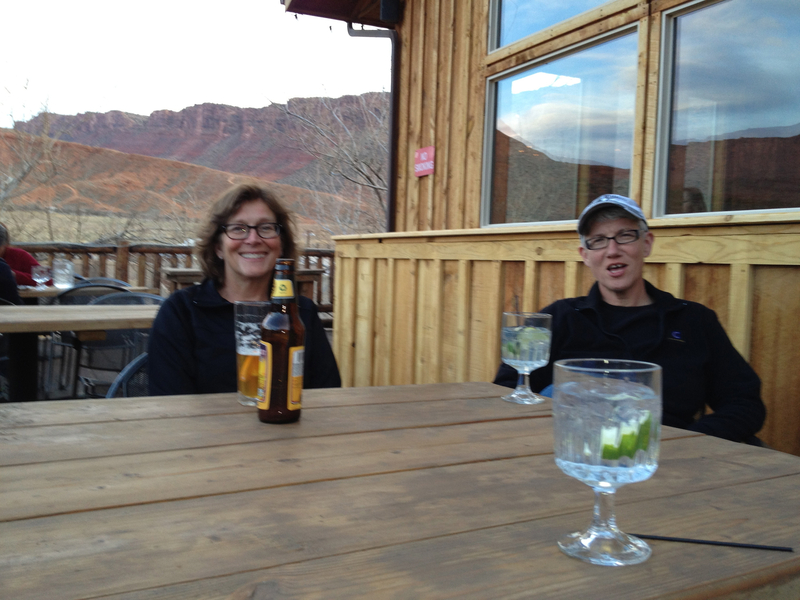 We typically stay here at the Vail Cascade in West Vail. Summer traffic was heavy and the drive up took nearly twice as long as normal. Since we arrived late, we dined in the hotel restaurant – Atwater. Super nice eatery though. I had one of the best steak dinners ever for a restaurant. I’m fairly critical on sirloin because usually I cook a better steak at home. Not this time. We sleep with the balcony door open to hear the rushing creek. 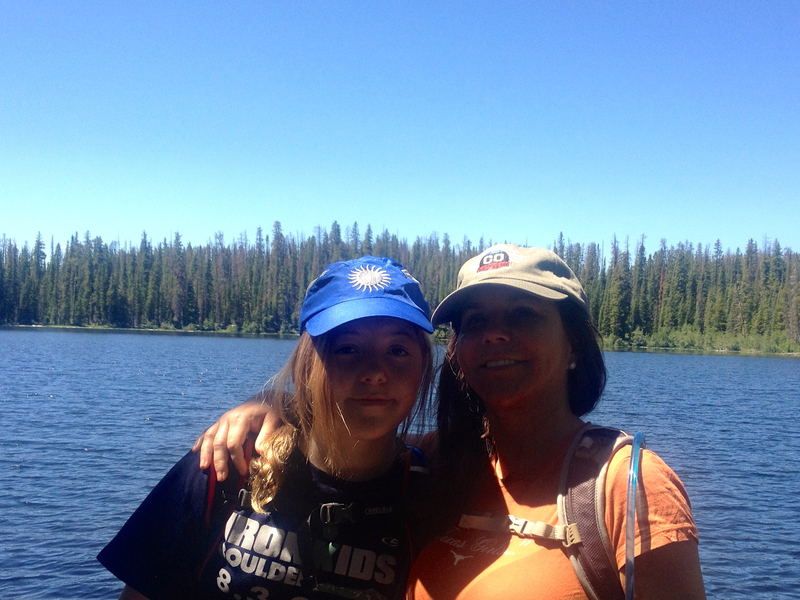 We start Saturday morning off with an aggressive 6.6 mile hike to Lost Lake. I know about this trail from the Concierge who not only has trail maps, she has hiked the trails. We access the trailhead off the North Frontage Road at Red Sandstone Road #700. This road begins paved through a neighborhood of switchbacks for 1.7 miles. It then turns to dirt but is easy to navigate with a low-profile, two-wheel drive car. We follow the dirt road for 2.7 miles to a Y intersection and steer left, following the #700 sign. The trailhead is another 3.9 miles up this road. Very well marked and easy to find. The mountain meadow flowers are in full bloom. We see Mountain Harebell, Aspen Daisy, and a yellow flower that I’m uncertain about. I think it’s Lambs Tongue Groundsel. 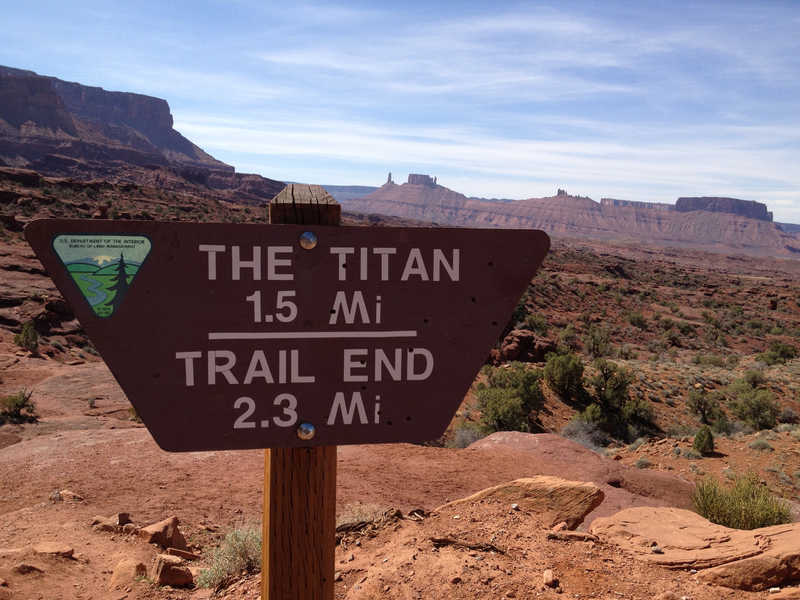 This trail is rated one of the easiest to navigate as the elevation gain is minimal – just a little over 900 feet. I expect to see more hikers but we don’t encounter any until we reach the lake. There was only one other car at the trailhead so this makes sense. 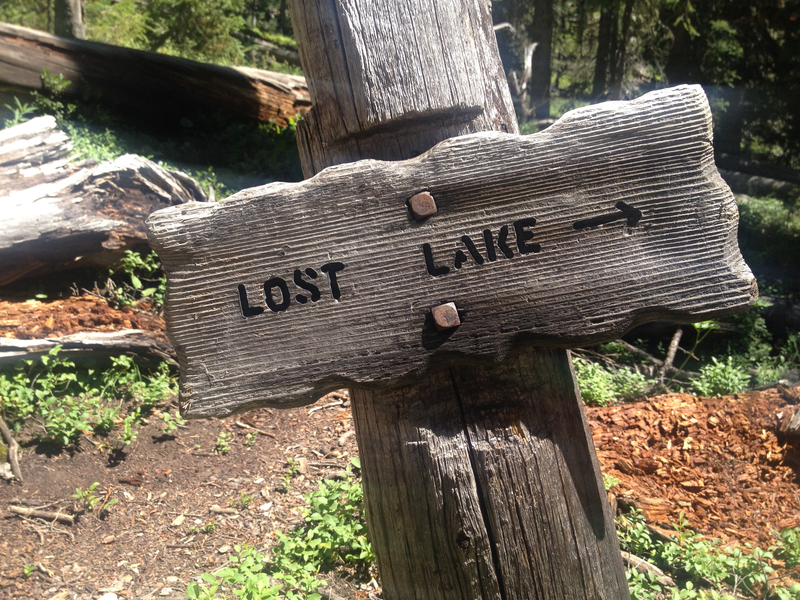 There is a second trailhead though a half mile beyond the lake. It requires 4WD, plus it would make for too short of a hike. At least for us. The lake is stunning. Perfectly blue. Ellie fearlessly bushwhacks around the shore to take pictures of some Lilly Pads. We rest a bit finding this spot so serene. A fisherman casts his fly and tells us this lake normally has some good cutthroat trout. They aren’t biting today though, he says because the dragonflies are hatching. Our return to the trailhead runs us into scores of late day hikers. Families headed out after lunch. There are now nine cars parked at the trailhead. Many more pass us as we head back down to Vail. Gorgeous first day hike. Looking forward to Sunday. 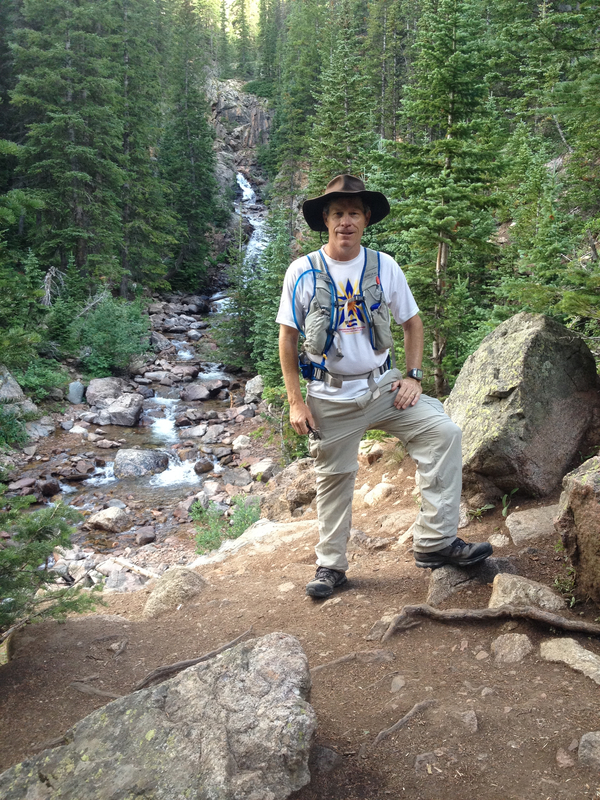 I begin my 80 mile backpacking adventure along the Collegiates West Loop of the Colorado Trail next weekend. My two best friends from high school planned this reunion of sorts back in April when they thought I was dying from cancer and they might never see me again. Suckers. Whatever it takes man, I’ll play the C card if that’s what it takes to get these boys back in the saddle. The two months of planning though have been brutal. 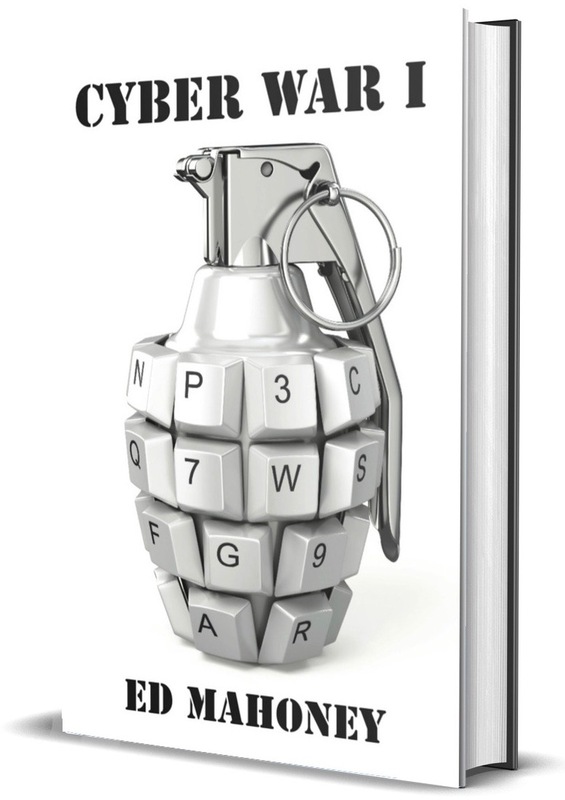 We’ve been emailing back and forth almost daily with anticipation. And praying the snow pack melts sufficiently above 11,000 feet to keep this hike from becoming a snowshoe event. Other than following snow conditions, much of our correspondence has been about gear. 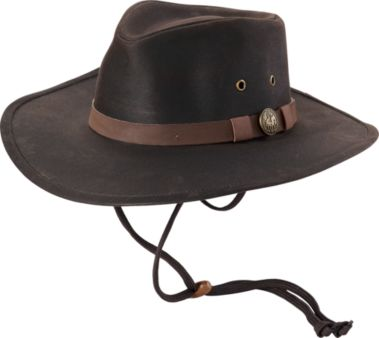 Karen and the girls gave me this waterproof, oilskin fedora this morning for Father’s Day. It completes my packing list. I’ll be packing a ton of new gear. 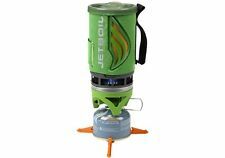 I bought this JetBoil gas burner for a mountain relay event last year that got rained out from the Great September Flood. Everything stores inside the canister for a tight fit. I’m guessing I’ll only need one fuel canister for the trip but I’ll pack an extra in the car. We will park a car half way on Cottonwood Pass to reload supplies. 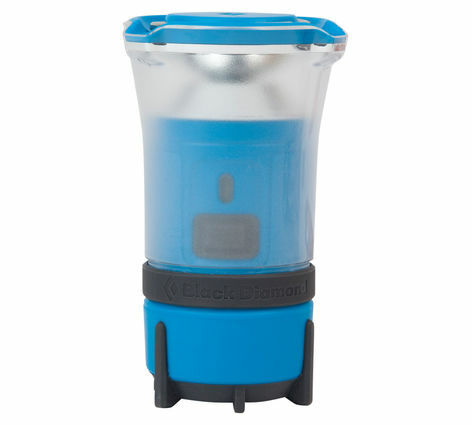 Yet another cool gadget that I have yet to use is this Black Diamond Voyager Lantern. It was a Christmas gift from my brother-in-law and I’ve yet to go camping since he gave it to me. I’ll use a headlamp too of course because that works so well when setting up a tent at night. But this will work well to light up my tent when getting dressed before the sun rises. Speaking of tents, this is my trusty one-man, Seedhouse SL1 tent from Big Agnes – an outdoor gear outfit from Steamboat. 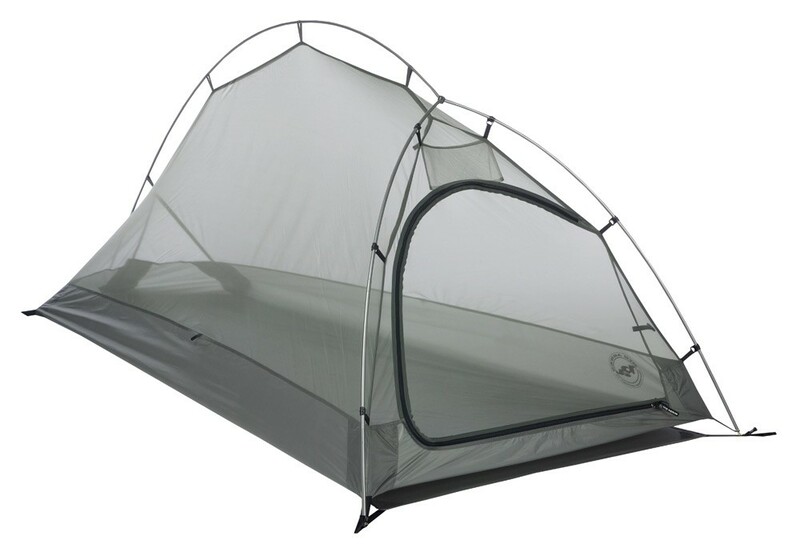 I used this tent for my Colorado Trail journey in 2011. It’s nice knowing I have some durable gear and that I don’t have to buy everything new for this trip. My sleeping bag also comes from Big Agnes. 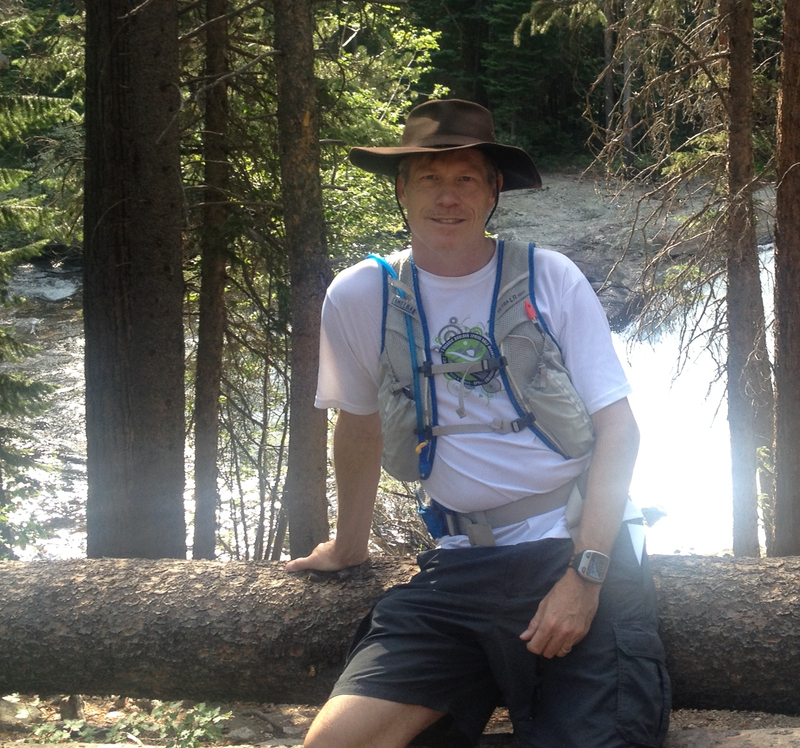 My Gregory Baltoro 75 backpack also makes a return appearance from my first backpacking experience on the Colorado Trail. This is a massive pack. 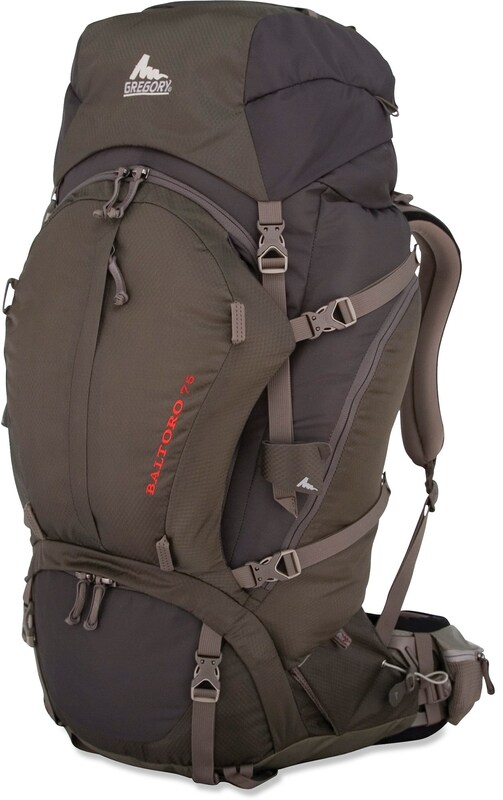 I could possibly get by with a smaller pack but I’m not that experienced at packing and don’t have ultra light gear. I’m experienced enough now though that I know how to pack this puppy. That link is to an REI video with tips for loading backpacks. Essentailly, keep heavy gear close to your spine. Consider loading your sleeping bag at the bottom. Put gear such as maps and other items you might need ready access to in a quick side pocket. I’m still trying to decide whether to load a 2 liter or 3 liter camel back water reservoir in my pack. Huge weight difference and I doubt I’ll ever drink 3 liters on the trail. 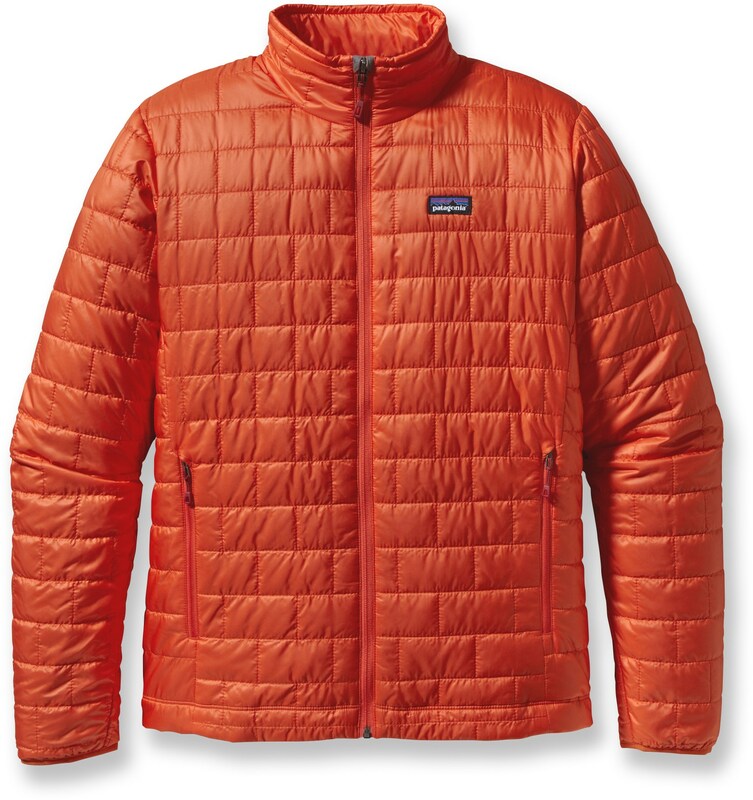 One item that will save space in my pack is my new Patagonia Nano Puff jacket. This is so light and compressed, relative to my 15 year old, bulky ski jacket. I might not need it during the day but the temperature can really drop at night. And I doubt we’ll escape rain. I also have a rain poncho to go over myself and pack that I got with my swag bag from the Durango Double Ultra last year. This jacket might have been my first purchase for the trip. I got it during REI’s annual sale at 30% off. 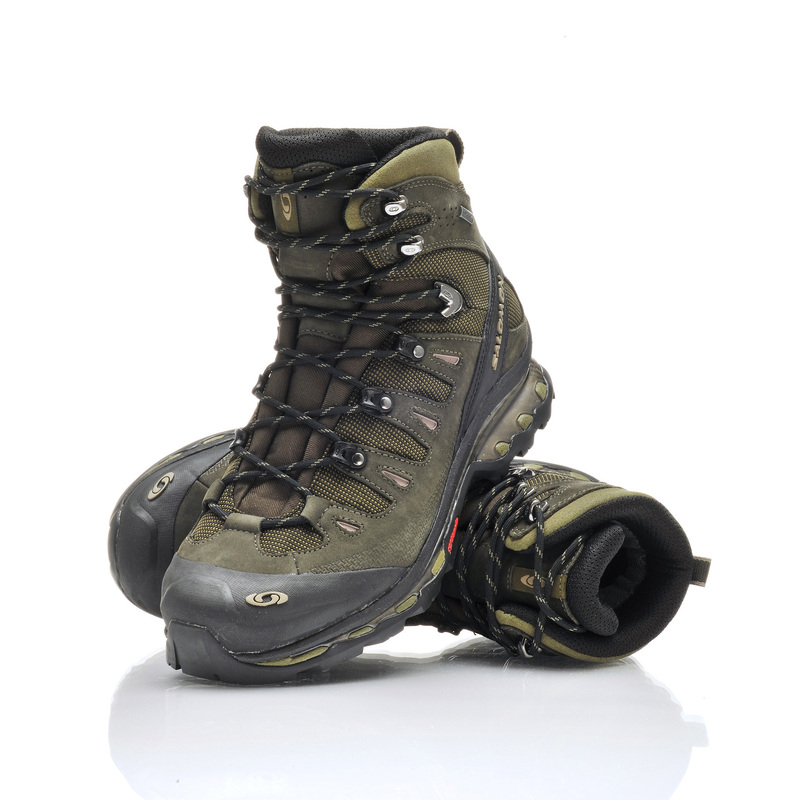 Another really exciting new piece of gear to my collection is this pair of Salomon Quest 4D GTX hiking boots. I’m excited because I’ve always only hiked in trail running shoes in the past. I’m hoping these relieve my feet and ankles of the expected fatigue after 12 hours on the trail. I like the freedom of running shoes. I absolutely love trail running. I don’t expect to be running though carrying a 35 pound backpack. My rationale for purchasing the boots was to be prepared for hiking across snow drifts. My experience hiking with Rob is that it’s doable without snowshoes but trekking poles are key. Crossing snow drifts is also much easier early in the day before the sun turns the snow into slush. Plus I typically let Rob lead so I can follow through his post-hole steps. The puffie and boots are my two big purchases. Got meaningful discounts on both. Food is the last topic area. Might not qualify as gear to some but food is very important to me. I hate most sports/energy food. Porting real food though isn’t too wise backpacking. Not because of the weight so much as that it can attract bears. I began reading Bill Bryson’s Into the Woods last night and I’m suddenly fearful of bears. I discovered these EPIC natural food energy bars recently and they are awesome. Some guy in Austin, Texas makes them. You can order them online, I’ve yet to see them in stores. They offer turkey, beef and lamb along with bison and average a good 200 calories. 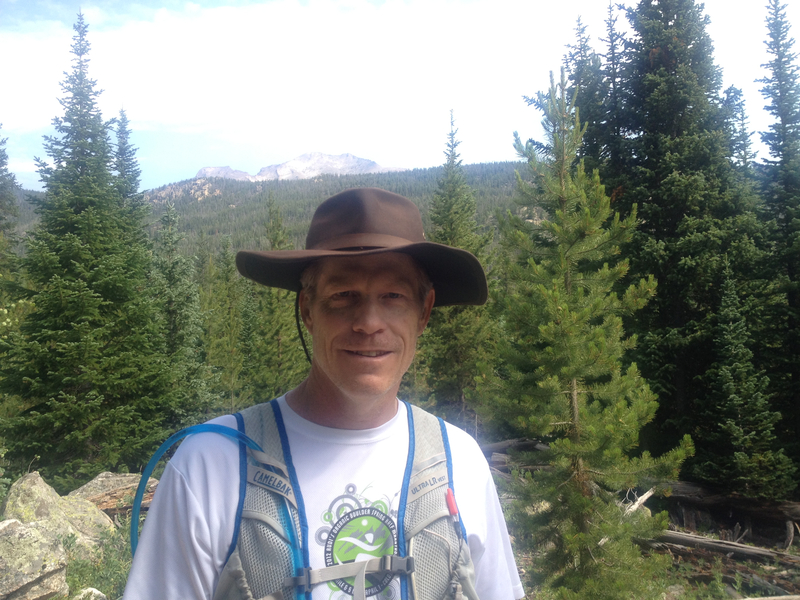 It’s not easy replenishing calories while backpacking so high calorie foods are important. My girls liked these epic bars so much hiking last weekend that I had to order more for my trip. I’m going high tech for water purification. Mike bought one of these too. Rob will have his water pump so we’re covered with multiple solutions if this gadget doesn’t live up to its hype. 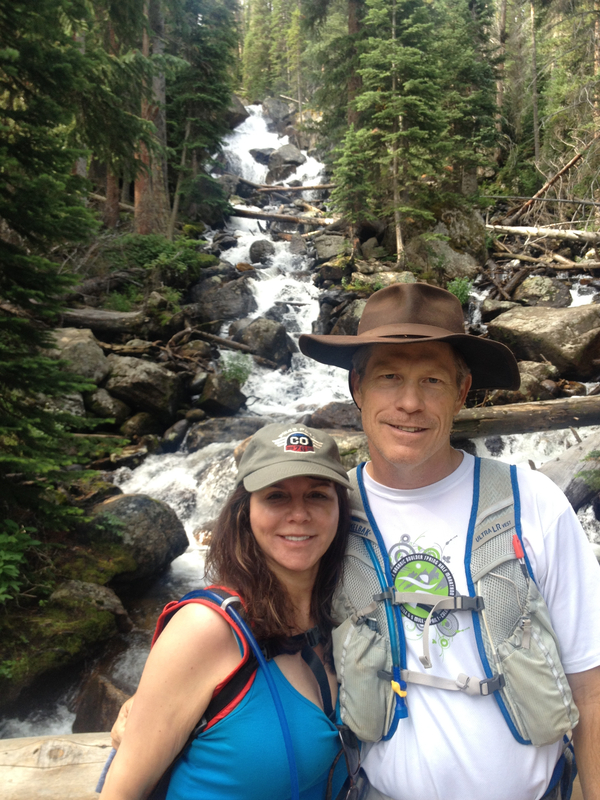 This only works well though for clear water, but I don’t expect to be wading through any murky streams at 12,000 feet. When you are hiking across the top of the Continental Divide, this early in the season with the snow melt flooding every gulch, it’s highly unlikely there will be sheep or cattle grazing above the water supply. I hope to report good results on this SteriPEN water purification tool. I suspect the way I will use it is to leverage a water bottle for collecting water. 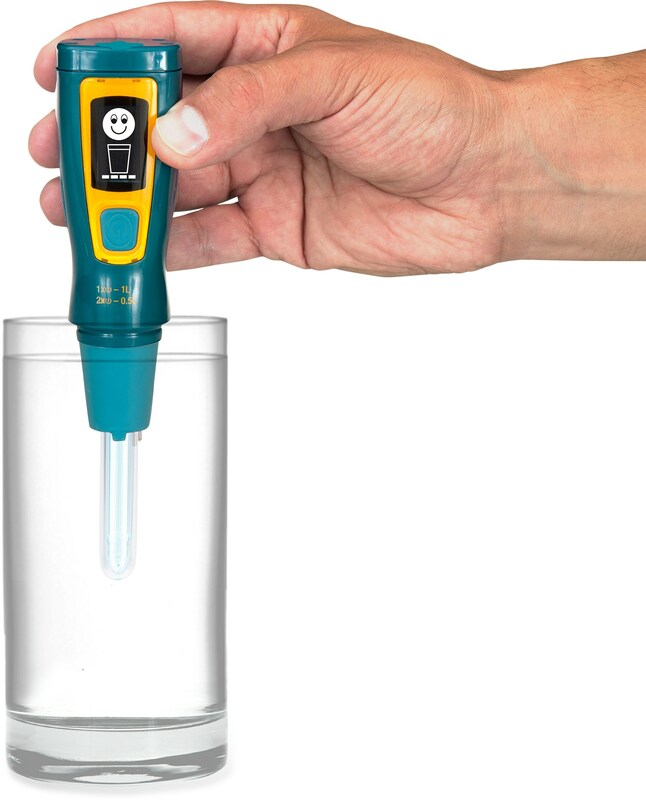 Use this UV light tool to purify the water. Then pour the water into my reservoir. Shouldn’t be too kludgy a process. I’ll report back on the success or failure of all my gear. I’m writing about it now because I’m organizing and packing this weekend. I don’t expect to be blogging from the trail but I might take notes on my iPhone’s Evergreen app to assist in recalling details. Few would ever confuse Karen for a camper. As they say in Austin, you can take the girl out of Northwest Hills, but you can’t take the NW Hills out of the girl. 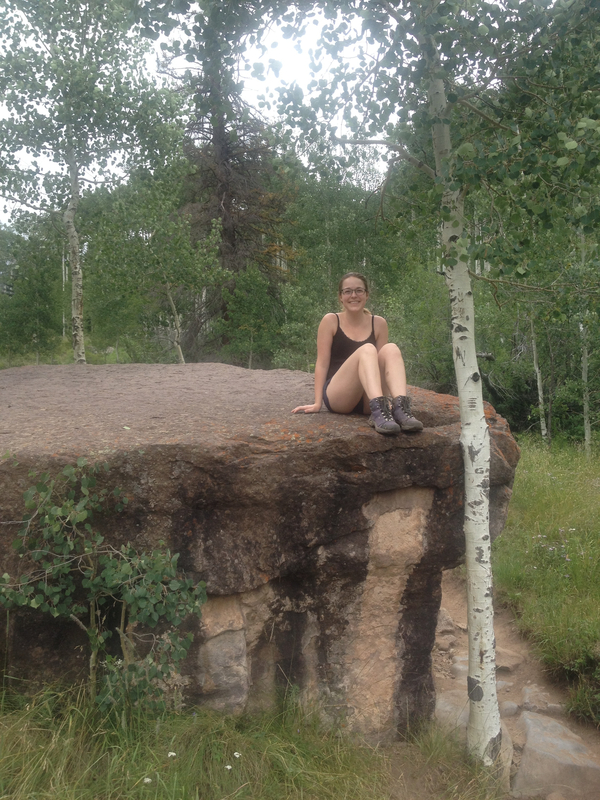 Still, she was quite a sport this Labor Day weekend as we camped out with a pack of neighbors at the Handcart camping site 5 miles west of Hwy 285 on CR 60 in Hall Valley and a short hike from Whale Peak. Karen even cooked everyone some tasty breakfast tacos Sunday morning. It’s been an awesome weekend. We were a bit late to arrive Friday night. Couldn’t cut out from work any earlier and hit heavy holiday traffic on I70 and Hwy 285. But we got there with plenty of daylight to pitch the tent. We didn’t have to worry about cooking as Dave had posole ready for the first course and grilled us up some fantastic fajitas. A cool front rolled in offering us the first taste of fall with a low of 45° overnight and 60s during the day. Several of us hiked up Mt. Bierstadt Saturday. 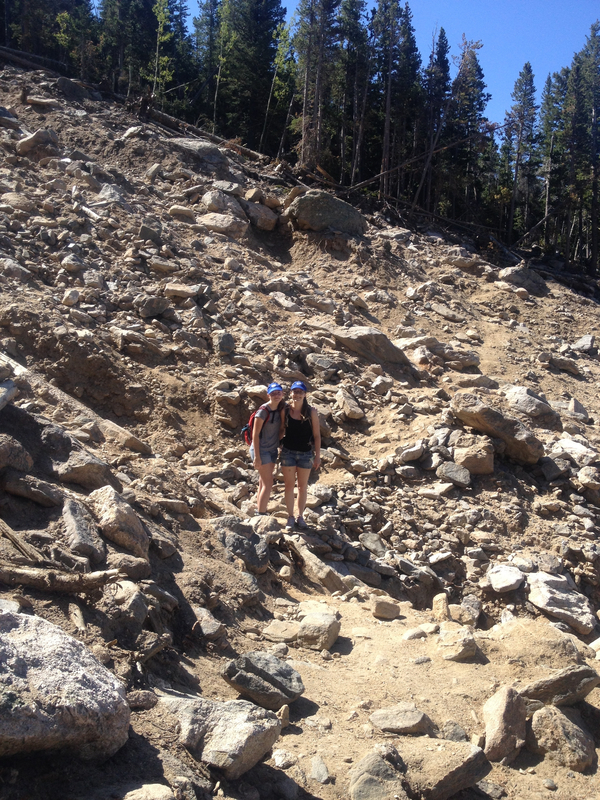 This picture captures Susan, Scott and Julie about half way up the trail. We alternated donning our wind jackets as the clouds danced back and forth across the sun. Kieth cooked a shrimp boil Saturday night that could have made a Cajun cry for having missed out. I drank some beers after the 2.5 hour hike, followed by some wine, topped off by a handful of TnTs in honor of Keith’s British background. The clouds threatened us with a few rain drops but held it in check as we enjoyed a magical night around a perfect campfire. Ellie sang us some tunes and before I knew it I was sound asleep. We finished the camp out the next morning with Karen’s breakfast tacos. Back home on the eastern slope of the Front Range now enjoying the start of autumn.